We continue delving into the Major Arcana Cards in Tarot. Click for part one and part two of this series. 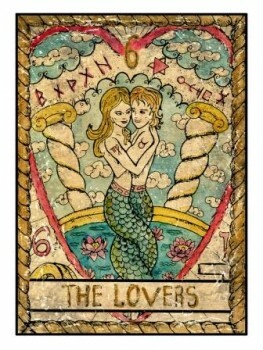 As you might imagine one of the meanings of The Lovers card is a romantic relationship, but also it may refer to a relationship in general whether that is sexual, platonic or family in dynamic. If The Lovers card comes up in a reading and at that time your relationship is under strain, then it is encouraging you to heal the rift and repair the bond. There is a second meaning to this card, which is regarding a choice you are faced with; it is likely the choice comes with sacrifices. For example, perhaps you have been offered a new job – with more money, but the job will have less of what you enjoy the most. The Chariot is a character building card – you are probably going through a difficult time right now, it could be work related, relationship troubles or otherwise. But now is the time to be strong, grit your teeth and power through. The Chariot signifies determination and willpower under difficult circumstances. It is not suggesting you rush in, careful thought is still needed, as is being fair, although results may not be instant you can rest assured that everything will come good in the end. If you are approaching what feels like an up-hill battle, this is a card you will be glad to see. It encourages you to charge ahead with the impossible, the task in hand may not turn out to be so difficult and success is yours to be had. There is no need to be pushy, but tackle things with self-belief and purpose. It will always be to your advantage to know when to plough ahead and when to hold back. Strength refers to many areas; it could mean recovering from accident or injury, strength of character, your moral code, your physicality or your emotional intelligence.